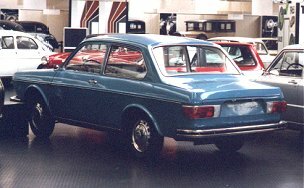 This model is in the VW Automuseum at Wolfsburg, amid other prototypes such as the Type 3 Cabriolet and the EA92, for a time intended to replace the Beetle, but later developed into the Brasilia. this design based on the 'Notch' in 1968. 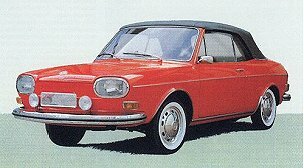 2-door and 4-door 411 Sedan introduced. 4-cylinder, horizontally opposed 1679cc twin carburettor engine, aluminium alloy crankcase, 76 bhp at 5000 rpm, CR 7.8:1, 93 ft lbs torque at 3,300 rpm, 90 mph (88 mph automatic), with full-flow oil filter; 26 mpg (24.5 automatic). Monocoque body with MacPherson strut /coil-spring at the front and trailing wishbone / coil-spring at the rear. 4-speed manual, or 3-speed automatic gearbox, hydraulic clutch, double-joint drive-shafts. Dual-circuit brakes, with servo on LHD models only, 155x15 radial tyres. 2-speed wipers, dipping rear-view mirror, 2-speed fresh-air fan, front headrests, and the celebrated (and sometimes cursed) petrol heater, with optional time-switch. 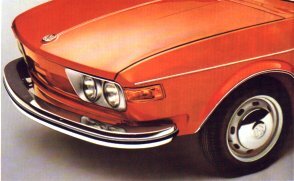 Oval single-piece headlamps, reversing lights. 'L' model includes extra exterior trim, rubber bumper strips, parking lights, clock, fully reclining front seats with adjustable lumbar support and pockets on back, carpeting on floor. Optionally, front vent wings on 4-door, rear vent wings on 2-door, front head restraints, heated rear window. 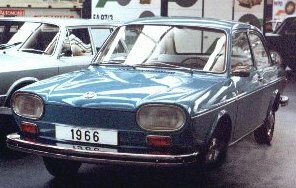 2-door estate ('Variant' or Squareback) included in range. Now available with Bosch D-Jetronic fuel injection; 85 bhp at 5000 rpm, 0-65 mph in 15 seconds, 8.2:1 CR, torque 99.4 ft lbs at 3500 rpm, max. speed 96 mph (94.5 auto), 28.2 mpg (27 mpg auto). Twin round halogen headlamps with matt aluminium surround. Variant tyres 165x15. 411LE 2-door, 4-door Sedan and 2-door Variant. Door triggers longer, door handle recesses deeper, stronger door locks. Padded steering wheel, screen wash/wipe lever switch on steering column, with flick wipe. Computer diagnosis wiring and socket. 412 model introduced; flatter bonnet, flashers set high on front wings, more angular headlamp surround, rear lamp clusters slimmer, and higher bumper position. Modified front coil-springs, stiffer anti-roll bar, larger calipers with thicker pad linings. 412LS introduced, with twin 40mm carbs and 1800cc; 85 bhp at 5000 rpm, 0-60 in 13 seconds, 100 mph. 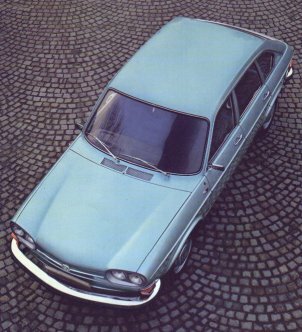 Long-lived engine; roomy body; quality of materials and finish; air-cooled! Long travel brakes (in RHD non-servo form); rust traps in floor, sills, door bottoms, bonnet front, rear engine-carrier mounts, and both outer and inner wings; high octane fuel needed; gearbox faults; petrol heater faults; shortage of experts in fuel injection systems (outside the club!). Wheelbase 98.4" Track (f/r) 54.2"/53.21" Overall length 180"
Height 58.5" Width 65" Turning circle 37 ft. Details extracted mainly from UK brochures; other variations were on sale elsewhere.